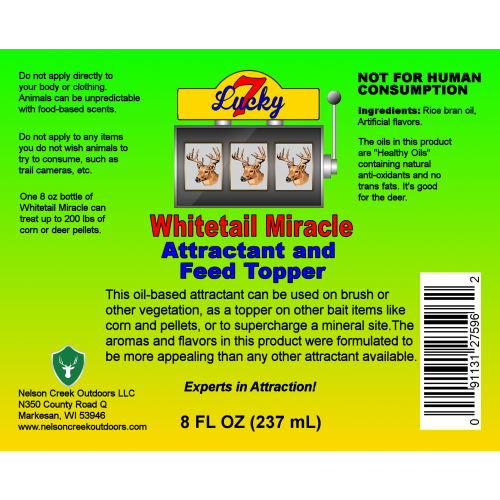 Lucky 7 Whitetail Miracle was developed to be the best food based whitetail deer attractant ever created. By utilizing taste and smell data acquired over many years, Nelson Creek Outdoors was able to develop an ALL-NEW highly concentrated scent/ flavor that is specifically keyed to be EXACTLY what whitetails crave the most. To us, it has an almost indescribable sweet, fruity, spicy, candy-like flavor and aroma. To a deer, it is pure heaven! 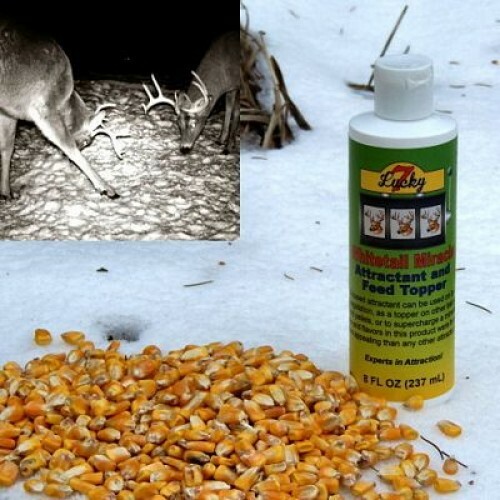 This new attractant is also very versatile. You can use it as a simple liquid scent, applying some to trees, brush or grasses to both bring deer in and to cover your scent. It is also a great feed topper. One 8 oz bottle can be mixed with up to 200 lbs of corn or pellets to Supercharge your bait. Have a mineral site/ block that isn't seeing much action? 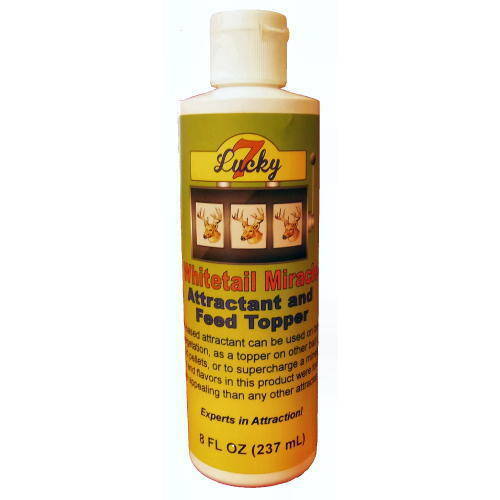 Pour on a bit of Lucky 7 Whitetail Miracle and deer will come in like it is a magnet. They not only love this unique new flavor, the oils used in this product are also healthy for them and stimulates appetite, a bonus especially in harsh winter climates. 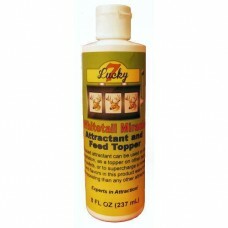 Lucky 7 Cover Scents and Spray Attractants are designed to both hide your human odor and attract dee..